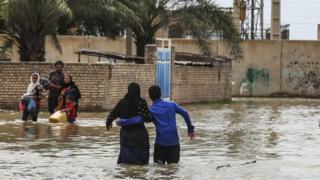 Iran has ordered the evacuation of about 70 villages in the south-western province of Khuzestan due to a growing risk of floods, state media report. At least 45 people have died in the past two weeks after heavy rains, with flooding affecting at least 23 of the country's 31 provinces. The orders come as Foreign Minister Javad Zarif accused US sanctions of impeding aid efforts to affected areas. "This isn't just economic warfare; it's economic terrorism," Mr Zarif tweeted. US sanctions imposed after President Donald Trump withdrew from the Iran nuclear deal last year have caused a shortage of rescue helicopters. The Iranian authorities have requested military help, including helicopters and amphibious armoured personnel carriers, for the rescue efforts. Evacuation orders were issued to seventy villages near the Dez and Karkheh rivers in the oil-rich province of Khuzestan, the governor of Shush country told the official Irna news agency. Storms forecast for the coming days are predicted to affect the west and southwest of the country. Tens of thousands of people have already been displaced, with many being housed in emergency shelter, according to state media. Two more people died in Hamedan province on Tuesday, Irna said, citing an official from the Red Crescent aid agency. Authorities in the western province of Lorestand brought in the armed forces to evict those who did not comply with the evacuation order. Governor General Mousa Khademi told the Isna news agency that they had lost all contact with the town of Pol-e Dokhtar. "We do not have any information on the situation there," he said, adding that they did not know how many people had been affected. After suffering from a decades-long drought, Iran has seen unprecedented rainfall in the last few weeks which has swept across the country. The Red Crescent tweeted that Golestan province in the north-east of Iran had received 70% of its annual rainfall in one day. According to local media there, rivers have burst their banks, infrastructure has been damaged and authorities have been forced to release water from reservoirs which are close to full capacity. Are floods linked to deforestation? This is the third major flood to hit Iran in the past two weeks. Environmental experts believe that deforestation has been one of the major causes of flooding in recent years in the country. According to Iran's Natural Resources and Forestry Organization, widespread and unregulated deforestation has destroyed around half of Iran's northern forests, areas where major floods have occurred. According to the organisation, the northern forests area has been reduced from 3.6 million to 1.8 million hectares during the past 40 years.